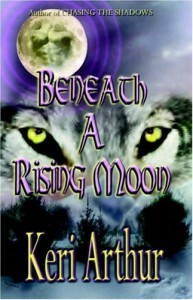 Received via FirstReads Giveaway.I really loved Keri Arthur's Riley Jensen series so was very excited to get to read Beneath a Rising Moon, which was apparently written first, and has now been re-released.It's clear that Arthur hadn't matured in her writing as much as in the Riley Jensen series as there were some definite anomalies when comparing. Not that I mean to compare them; it's more of an observation to set reader expectations. The world building in this book is fairly weak. I know it takes place in the mountains of Colorado, with a small town and a large mansion as the primary locations within that context. Try as I might, I couldn't get a real picture in my head of what either might look like. Additionally, the 'rules' of what werewolves could/couldn't do (where do their clothes go when they change, hierarchy, etc) were very vague. I had to infer most of it, and frequently, I wasn't sure if I was right in my interpretation.Also, I still don't know if this is a world that actually has humans in it. Is the setting (town) only comprised of werewolves? If humans exist in the world, are they aware of the werewolves?I did like and believe in the romance between the protagonists, Neva and Duncan, which is good, since this actually is a paranormal romance, versus Urban Fantasy. Also, this helps alleviate some of the frustration about the lack of world building, which would have been disastrous in UF.Overall, it was a pretty decent PNR, and I would recommend it.